PC-19 European Clearcoat is a premium 3.5VOC high solids clearcoat that provides the highest gloss with exceptional clarity, and a depth of image that out performs other clears on the market today. 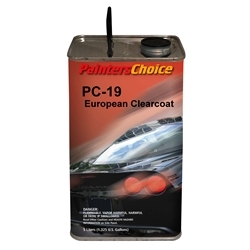 PC-19 European Clearcoat is a premium overall clearcoat that should be used when the best possible finish needs to be obtained. This 2:1 clear must be activated with PC-1960, PC-1975, or PC-1985 Activator.